Who doesn’t know the Godfather theme by heart, right? This video lesson is an interpretation of Slash’s version of the song, which is actually called Speak Softly Love, and was featured in the first part of the Godfather (when Michael Corleone meets his first wife in Sicily). Slash’s cover of the song is epic and a real crowd-pleaser at concerts. You’ll need to use distortion and set up a bit of delay effect to get it sounding right. It’s an easy guitar song to learn and play, beginner guitarists will find it a lot of fun as well, since it doesn’t take years to get a hang of. 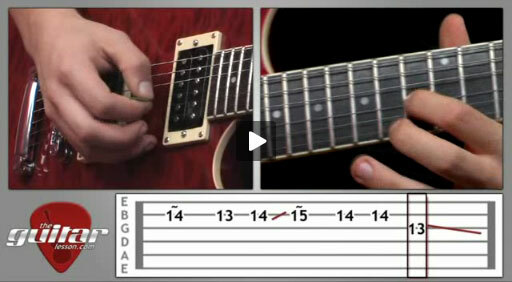 It uses many lead guitar techniques, that is why it was chosen to be part of these lessons. You’ll really be practicing vibratos and string bending almost non-stop in this song, as well as alternate plucking of single strings. All-in-all, this is a terrific song to practice and advance your lead guitar techniques with. Learning how to play the Godfather theme will develop your guitar soloing techniques, including the vibrato, string bending and sliding. Speak Softly Love (Love Theme From The Godfather) is a song that first appeared in the 1972 movie, The Godfather (1972). Its instrumental version became popular as The Godfather theme, Speak Softly Love is the vocal version. It was written by Larry Kusik and composed by Nino Rota. Slash from the Guns N’ Roses performed a popular cover of the song in a hard rock style, which is the topic of our lesson. Slash's version contains backing chords from Izzy Stradlin, bass from Duff McKagan and piano from Axl Rose. Slash’s solo at the end of the Godfather theme is improvised differently at each live event. Sorry, but you've reached a premium content area. The download of the Godfather Theme tablature file is only available to premium members. Sorry, the same goes for the backing track. To download the backing track to Godfather Theme, please log in and revisit this page. Sorry, but some of my lessons don’t teach the entire song, since my site is aimed at beginner-intermediate players, and as such, I don’t teach the overly complicated parts. Thanks for trying my site and all the best!